Tagging in onCourse is a powerful tool that allows you to add additional hierarchical information to records in a way that can be easily used for searching and grouping records. When specifically related to Course records, tags are flexible ways for you to categorise your data and organise the navigation of your website. Tag groups applied to other record types can be used for internal navigation and grouping, but will not affect the website. Tags can be created and edited by navigating to "File" -> "Preferences" -> "Tags". This will bring up a list of Tag groups. By default, onCourse will have a special tag group called Subjects that exists in your new database, whose name can not be changed. The main tag group, used to drive your website and in the export of courses and classes for print production and many standard reports, is the "Subjects" tag group. You can create the categories that are appropriate for your organisation, and any sub categories that are needed. Tag data is hierarchical so for example, under the category 'Computers' I might find tags with names like 'Microsoft Office', 'Adobe Creative Suite', 'Tablets & Smart phones'. There are no limit to the number of levels of hierarchy you can create, but from a user and navigational perspective, generally three levels are more than sufficient to represent the range of data you are tagging. Any course tagged with a sub tag like 'Microsoft office' would also be visible if I clicked on the parent tag 'Computers'. As a general rule of thumb, a website visible tag should apply to a minimum 3 to 5 course records, and a maximum of 10 to 15 to give the website visitor a useful and workable group of courses to browse. For each tag group, you can decide if applying a tag from the group is mandatory or optional. A mandatory tag may make sense if you want to ensure your staff always tag every course in your database with a website navigation tag. You can also choose whether the tag can be applied an unlimited number of times, or only once. You can also decide if records can have more than one tag from the tag group. 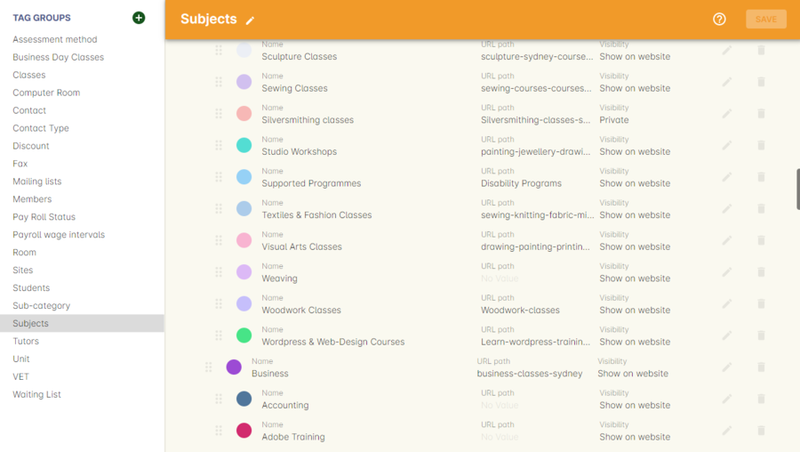 Giving courses multiple subject tags mean they can be listed in multiple places on your website. For example, an MYOB course could be tagged with both 'Accounting' and 'Computers'. You can add any number of tags by clicking on the "+" icon. To add a subcategory tag, first click on a tag to select it and then click once again on the "+" icon. By default, tags will be sorted by alphabetical order. 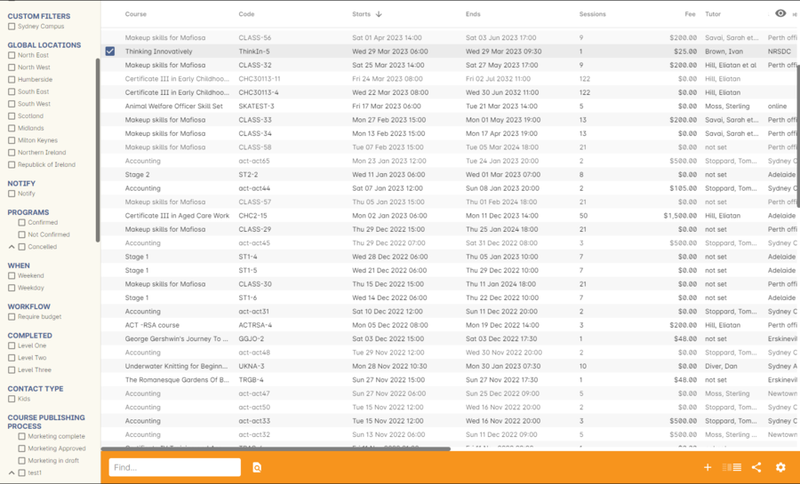 The tag edit view also allows you to apply your own sort order to the tags. Highlight a tag in the list then drag and drop a given tag item within the group to the place in the hierarchy you wish it to go. When setting up your subject tags, it is advisable to only apply these subject tags to Courses and not to classes or other types of records. The reason for this relates back to the hierarchical nature of the database the information that is connected back to a course. For example, a Course within the database will have classes, and within a class tutor(s) will be assigned, room(s) allocated and students enrolled. From a filtering perspective, by applying a subject tag to a Course, when you select the subject tag filter within any window, e.g. 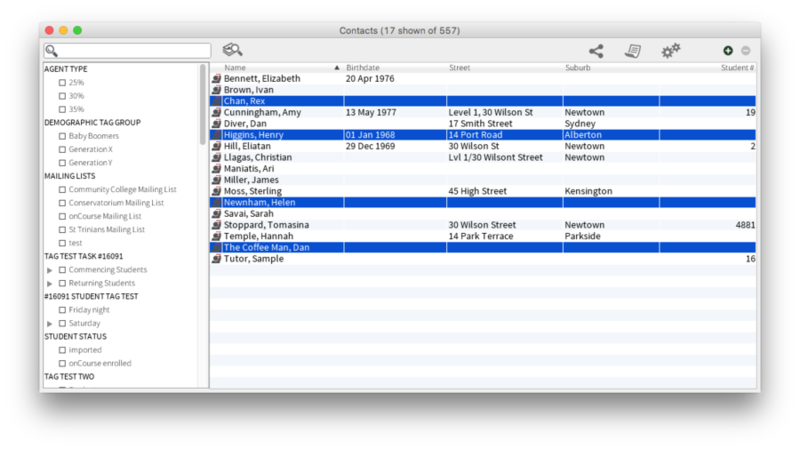 contact, the related information such as student enrolled in a class from a course with the tag, or tutor teaching a class from the course with the tag, will be displayed. If you apply the tag directly to contact records as well as Courses, the meaning of the filter will change to also include the meaning above "AND show me all the contacts tagged with" which can lead to a returned results list that doesn't make much sense to the user. In the following image you can see in the class window. The information has been filtered by the "Business" subject tag. Even though the classes listed are not tagged with the "Business" subject tag, but the classes all relate to a course that has the '"Business" subject tag, they will display automatically. 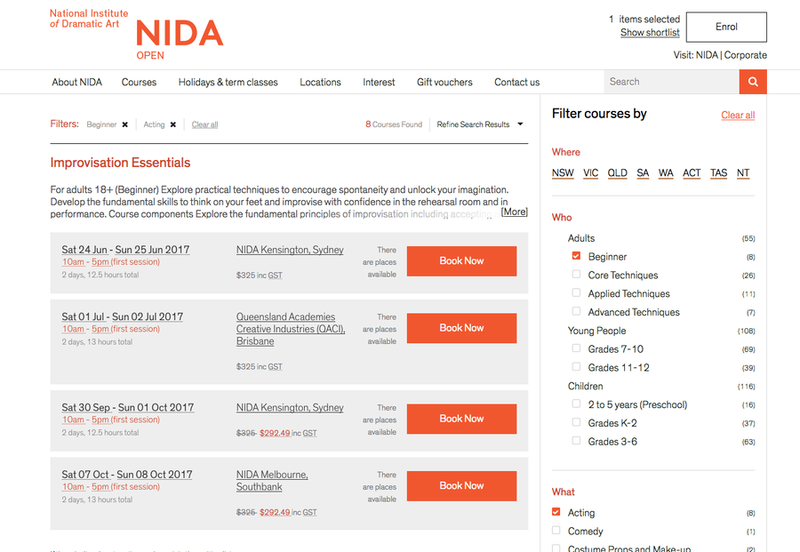 Course tags, beginning with the Subject tag group, define your website user navigation experience. Any new tags you create, or changes you make to any existing tags will update automatically on the website. By default, all tags within a tag group are set as 'show on website' by default. If you uncheck this option, the tag will no longer show on the web, but will still be visible inside the onCourse application for your own internal filtering. This can be a better option than deleting a tag and all it's relationships to historical records, if the tag is not currently in use for active courses. If you have two onCourse websites for two arms of your business, each website may be driven by it's own tag group. For example, a site for open enrolments might be driven by the subjects tag group, where the corporate site might be driven by a different tag group called 'corporate'. If this is the case, every course that you want to show on each website, must be tagged by a tag from the defined website tag group, even if that tag is not currently shown on the website. In this multi site situation, a course tagged with a non-visible tag will still be accessible via the course URL if you wish, while not being accessible via the navigation structure. Without a tag from the defined website group, the URL will return 404 not found. The URL for the subject tag group is /courses/subjects. This URL will contain any information that has been added in the 'Detail' field for the Subjects root tag. 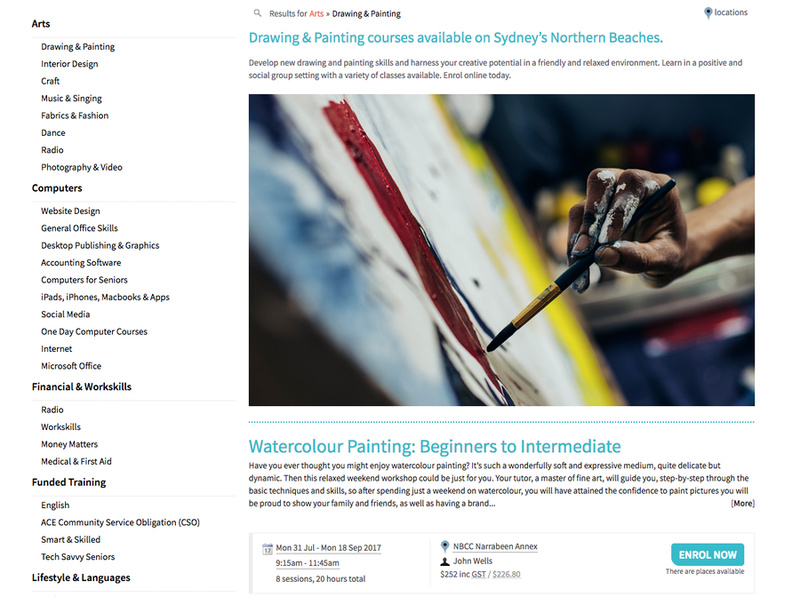 If you set up a first level tag within the subjects tag group which is entitled "Arts", the URL for that tag on your website would display as /courses/arts. You can also display second and third level tag hierarchy within the URL, here is an example of a second level tag entitled "Photography" under the Arts tag: courses/arts/photography. 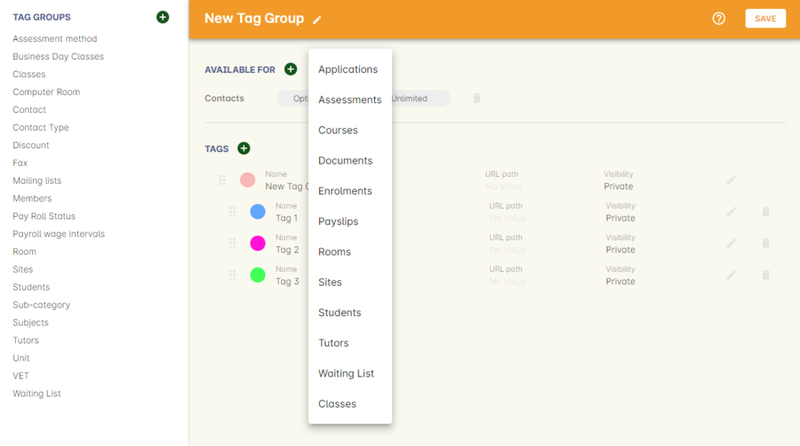 Whilst the default tag structure for website URLs are set to recognise tags under the Subjects tag group, you can also show other tag groups for Courses on the web, as long as you define the tag group as being web visible by clicking the Visibility field, then selecting 'Show on website'. An example of utilising a different tag group within a URL would be as follows: /courses/demographic/return-to-work for a tag group called 'Demographic'. Within the tag group edit view window, you can change the URL path of the tag name. To change the default URL path, simply click on the padlock next to the field URL path then edit what you want the URL path to be. So in the example below the URL is being changed from /courses/Creative+Arts to /courses/Arts. Tags can contain rich text descriptions, including images and video or other html content, which will display on your website at the top of the course list results for that tag. Flag the tag as web visiblewithin the tag set up. Using rich text, enter the information, description of the tag into the detailfield for that tag. You can also add images to the tag web description by uploading the image to onCourse via the Resources > Attachmentsmenu. For more information about rich text and adding images, refer to the rich text chapter of the User Handbook. The special Subjects tag group is just the starting point for website navigation using tags, and can be thought as the equivalent of the dewy decimal system of course grouping. However, you may wish to build a website where there are multiple ways a potential student can browse through your course offerings if they don't know 'what' they want. Some examples of other types of course tags in use by onCourse customers include 'who' (or demographic) type tags, 'where' (location, term/holiday program) or 'how' (delivery mode, duration or level). It is important to consider at this point, before you decide to create multiple tags groups to record all this additional data, if the information you want to navigate by is a 'saved search', as in, onCourse already has this data stored in the class information, or a tag - new information about a course onCourse doesn't store anywhere else. The location of a class can be found via a saved search as the site address details are stored in the database already. The information about a course being a 'workshop', 'short course' or 'program of study' is a user defined definition that is best added to the course by a new tag group. Both tags and saved searches can be used to navigate the website on their own, or in combination with other tags. This kind of navigation is called faceted search and needs to be carefully and considered and designed to meet your particular business needs before being implemented by the creation of and application of new tags to your onCourse data. Faceted search allows users to see a pre-count of available class information as they refine their search options. In this example, a two tags called 'Who' and 'What' combine to form a faceted search across a large data set, to allow website visitors to drill down and find the course and class they are looking for as quickly as possible. To create a new tag group, begin by going File > Preferences > Tags and clicking the + button in the top right hand corner. Begin by giving your tag group a name and deciding which part of the onCourse database you want this tag group to apply to. A tag group can apply to multiple record types, but can not be applied to record and a record sub set. 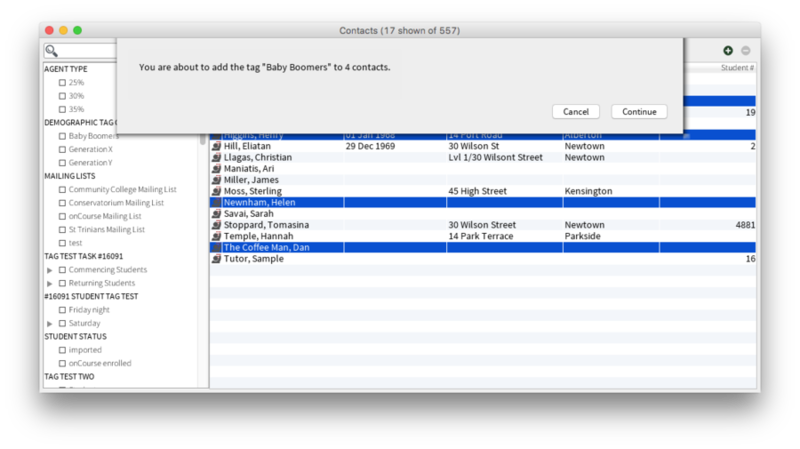 For example, you can not apply a tag to both 'contacts' and 'students' as students are a type of contact. For the same reasons, a tag can not apply to both 'courses' and 'classes'. Only tags which apply to 'Courses' will be available for display and navigation on your onCourse website. Tags which apply to other record types are for internal filtering only. Begin building your tag structure by using the + button. The first time you click + in a new tag group, that will create the parent tag. Each subsequent click of the + button will add a child tag underneath the parent. If you wish to adjust the tag structure, you can also drag and drop the ordering from the default alphabetical sort order. You also have the ability to make changes to the root tag, however you won't be able to add a sibling or delete the root node. In the case of the special Subjects tag, you can not change the root tag name. All tags groups you create will be available as filters within the relevant onCourse list views. The tag groups shown are based on the record type the tag is related to, and then the records related to that record type. For example, a tag group applied to Courses will also be available as a filter in the related windows of classes, contacts and enrolments. In the course window, checking the filter means 'show me course records tagged with this tag'. In the class window, checking the same subject filter means 'show me the classes for the course tagged with this tag'. In the student window it displays as Subjects (enrolled), and means 'show me the students enrolled in classes linked to courses tagged with this tag'. Use the tags to filter records within a given list view by checking the tick box next to the tag name. Ticking a tag that contains sub tags will select all the tags beneath it. Selecting multiple tag check boxes within the same tag group to create an OR search. e.g. selecting 'Business' and 'Writing' from the subjects tag at the same time will find results tagged with Business OR Writing. Use a tag filter in conjunction with a core filter or saved search. This will create and AND search. E.g. current classes AND subject 'Writing'. Use the advanced search parameter of "tagged with" or "tagged with (including children)". This means the search will include any records which have been tagged with second or third level tags within the hierarchy, also known as "children". Use a combination of advanced search, tag filter and core filters. The advanced search will operate within the filtered set of results your checked options will limit the list of results to. Sometimes, creating a tag group to add information to a record is not the best choice for your needs. If the data already exists in the database, you could use a saved search to achieve the same result. The benefit of a saved search is that it works automatically, as opposed to a tag that needs to be added to a record, and if the properties of the record changes, you don't need to remember to change the tag. An example that could be a tag or saved search is the class concept 'Term'. A term is a date range that represents group of classes that start within that range. You can create Tag Groups and sub-tags to achieve this, however you can also achieve the same result with less work with advanced search. Both options will deliver you a check box style filter in the classes window to use to locate records quickly. Click on the Cog Wheel, then choose Save Find, name the Find to "2017 - Term 1". You can choose to make this filter visible to yourself or, to all staff using onCourse, then click Save. 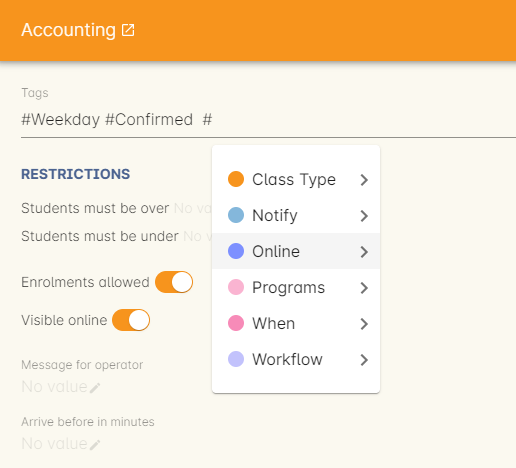 When you next open the class list view, you will see your saved find as a check box in the window. After you have created your tag groups and their structures, you need to assign these tags to your records. This process can be done record by record in the edit view, or in bulk from the list view. To add a tag to a record, open the record and click on the icon which looks like a luggage tag. This will show you all the tags available for that type of record. You should always choose the tag furthest out in the tree - you don't need to add a tag from each level. In the example below, we are adding the tag 'computers' to the course record. You shouldn't add the tag 'Computing, Business & Professional' to this record. You can remove a tag by clicking on the minus symbol on the tag name that is visible when you hover over the tag name. 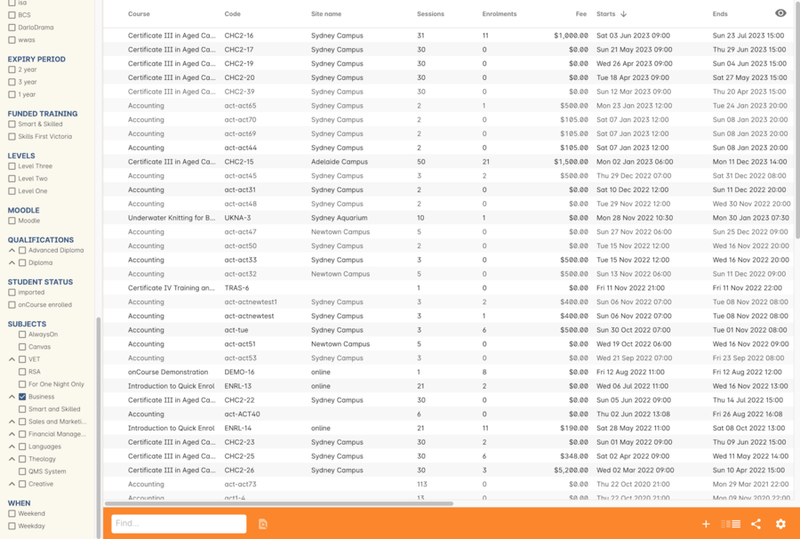 A great feature in onCourse is bulk tagging. This is just like regular tagging except you are applying this tag to multiple records at one time. First, make sure that you have tags created, if not go to File > Preferences > Tags and set this up (see above for more on this) and ensure it is set as 'available for' the correct record type e.g. tutors. Open up the list view of records where you wish to apply the tag in bulk, like "Tutors"
Once you right click on the tag you want you have two options: add or remove the tag from the selected options. After you select your option click on "continue" and the tags will be added. Once this process is finished, the records you have highlighted will be tagged. You can double click on the record to open the edit view and see this. To bulk remove tags from records, simply follow the steps above but choose "Remove this tag from X highlighted records " instead of "Add this tag to X highlighted records"